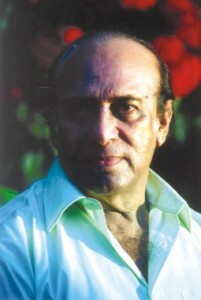 Masud Ali Khan is a senior stage and small screen artist, admired for decades. Actors with decades of experience behind them move viewers as new faces with their handsome mien fail to do. Their smiles, pauses, delivery of words, manner of glancing appear so natural and moving that one is mesmerised by their appearance. There just isn't anything like an old play on stage or an old face to fascinate you and make you oblivious of the humdrum of life. Like a good book or a fine score of music, plays are the oasis of our harum-scarum twenty-first century existence. For senior artistes like Masud Ali Khan, acting is like breathing. Khan has no airs about him. He goes for evening walks, enjoys having tête-à-tête with his nearest family members in Dhanmondi. And then he sips his “café au lait” at Café la Verandah at Alliance Francaise, reading magazines, newspapers and exchanging views with his friends and acquaintances; that is his weekend routine. Yes, he has vacations with his son in the US. But his heart is where his roots are. Dressed in a royal blue jogging suit and tennis shoes, he appears to be the epitome of contented over-sixty life. He knows the senior journalists, writers and actors, who've formed an integral part of the Dhaka intelligentsia. He loves to reminisce and talk of the times -- some decades back -- when one had to work with a soul pitch or not at all. Shahidul Haque, Tawfique Aziz Khan, Waheedul Haque and Enayatullah Khan (Minto Bhai) were among his peers. Could one have asked to be born among more brilliant stars of our society? As for reputable actors and actresses -- he rubbed shoulders with the brightest of them every other day. Despite being a senior citizen -- Masud Ali Khan works spiritedly and effortlessly with the world of thespians -- where each nuance, posture, and gesture carries innumerable meanings. He does not rest on his laurels. Dashing and assertive -- even today-- with his winning smile and twinkling eyes, he could delight you with his casual repartee for hours together. He is not just nostalgic: he takes delight in participating with the present generation on screen. Most of the story-lines on the “telly” are domestic dramas: they're not quite complete without the father figure, or the senior friend and guide -- who comes to the rescue of romancing pairs, or college girls in quest of new horizons. Recitation and acting on stage have been an integral part of school and college formats of leading schools and colleges in the subcontinent for decades. Masud Ali Khan took part in every annual school play of Jamirta High School, Manikganj, with enthusiasm. He moved on to Kolkata when he was in class five, during the colonial times. He was admitted at Rippon College, but went back to Manikganj for the annual drama occasions -- as he took his formal exams in East Bengal -- where his paternal grandmother lived. When in class eight, he went to Kolkata permanently, to be with his parents. After Partition, he came to Comilla, and stayed with his brother in-law, while his parents remained in India. During his college days at Jagannath and Sir Salimullah Colleges, he was into plays with gusto. The plays included those of Bidhayak Bhattacharya, Monoj Sen Gupta and Mohendro Bhattacharya. “My family may not have encouraged me in my interest in the stage, but they did not discourage me either. I then joined Bangladesh's first group theatre in 1958. When the TV came in at DIT, the plays were live ones and not recorded, thus the experience was more exciting than recorded events that followed later. 'Bhai, Bhai, Shobai', written by Prof. Nurul Momen was an unforgettable experience for me. After that, acting came like breathing, walking, laughing in my everyday routine. It was an everyday incident in my existence, part and parcel of my existence,” says Masud Ali Khan. Did he do anything important apart from acting? The veteran actor says that his livelihood included working for tourism. There was the Public Service Commission of the then central government of Pakistan. He worked in the Tourism Department and that too entailed interesting aspects of life and living. Staying at the head office at Karachi, he toured many countries, such as the US, Germany, the Netherlands, Belgium and Italy (where he had his training). He dealt with transport, administration and public relations -- and none of this was boring. After 1971, he worked for the “Parjatan Cooperation”. Here too he never had an idle or tedious day. His escape via Afghanistan and India to Bangladesh was also full of excitement and dramatic incidents. Having sold off their possessions at dirt rate price, he and his family went from Karachi -- taking the ticket for Peshawar. They were chased by the police, and intimidated by unsympathetic neighbours. The “agent” had instructed him and his family to stop midway, and catch the train to Quetta, to set the spies off guard. From Baluchistan, they got onto a truck, careful not to speak to anyone -- especially if someone were “picked up”. Fatigued, hungry and shivering with fear, they were never so happy as when they reached Bangladesh -- with two tiny, battered suitcases.